LLNL postdoctoral researcher Arjun Gambhir contributed to the research. 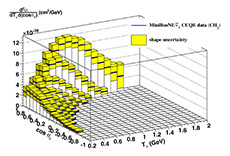 Co-authors include Evan Berkowitz (Institute for Advanced Simulation, Jülich Supercomputing Centre), M.A. Clark (NVIDIA), Ken McElvain (LBNL and University of California, Berkeley), Amy Nicholson (University of North Carolina), Enrico Rinaldi (RIKEN-Brookhaven National Laboratory), Chia Cheng Chang (LBNL), Ba ́lint Joo ́ (Thomas Jefferson National Accelerator Facility), Thorsten Kurth (NERSC/LBNL) and Kostas Orginos (College of William and Mary). For most of the lab, the end of the annual cyclotron shutdown period marks the beginning of a new experimental season, as beam time makes its way around the facilities. But for the team behind TRIUMF’s Ultra-Cold Neutron (UCN) project., it is a time to reflect on the progress that was made and assess the final steps towards realizing a first production of ultra-cold neutrons by early 2017. 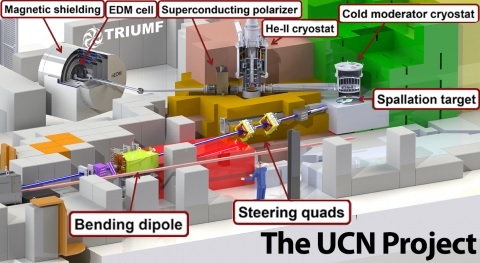 The UCN source will produce, through a tungsten spallation target, ultra-cold neutrons, which will enable researchers to study the neutron electric dipole moment. Essentially, the team will be probing the distance of the electric charges in the neutron. This requires complex infrastructure. The problem: it can only be installed during the shutdown period. Ruediger Picker (RP), a researcher in the particle physics department and UCN project leader, spoke with Communications Assistant Kelsey Litwin (KL) to provide an update on the installation process. KL: During our last check-in, at the end of the 2014 annual shutdown, the UCN team had just tackled the “immovable block,” hidden underneath the support system of the M15 beam line. It had been in the direct path of the new UCN beam line, which will deliver protons to the tungsten spallation target. Can you give us a summary of what was done since then? RP: A lot of planning. While the front-end of the M13 beam line and the PIENU experimental areas were cleaned up, the downstream section of the UCN beam line and the kicker cable routing was planned. The kicker magnet for the UCN beam line is a fast ramping magnet. It ramps up and down in less than 50 microseconds. As a result, the cable to power the supply needs to be very large and heavy. The power supply sits on top of the cyclotron vault roof, while the kicker is below in the vault tunnel area. The cable therefore has to penetrate the cyclotron roof beams, needing an S curve routing to avoid radiation shine upward. KL: The plan for the beginning of the 2015 shutdown was to decommission the M13 beam line and prepare the experimental area. How did that go? RP: The decommissioning was planned between the 2014 and the 2015 shutdowns. There was a special focus was on the two dipole magnets, B1 and B2. It was decided that the active iron yoke of the B1 dipole would be used as shielding. During the shutdown, the B2 yoke of the dipole magnet was retrofitted to make it a shielding block, the B1 magnet was moved temporarily for later use, and the M13 beam tube has been sealed to allow pumping down to vacuum. This renders the M13 beam line fully decommissioned. The experimental area was cleaned up in preparation for the continued installation. As well, the kicker cable was successfully routed as we had planned and the downstream section of the UCN beam line, BL1U, was installed. Finally, the base layer of shielding below the tungsten spallation target was laid down. All in all, I would say that all important shutdown projects were completed successfully. KL: With hopes to stay on track for first beam time in late-2016/early-2017, your team certainly does not have any downtime. What is the team up to while physical work is not underway? RP: We are currently planning the UCN source integration. The source cryostat needs to be incorporated into the TRIUMF infrastructure, in a way that is safe and able to be controlled remotely. We are also designing the last three meters of the beam line, including the target crypt, which connects to the BL1U beam pipe and the target remote handling system, and the target itself. A target remote handling review was conducted in July and we will receive the review report soon. The schedule for finishing the target remote handling system is tight, but doable. So far, the plan is to have first beam in BL1U by mid 2016, beam on target towards the end of 2016. KL: You provided us with a time-lapse video of the installation taking place in the Meson Hall over a four-month period. What would you like for someone watching it to take away? There are four things that I would like to show people. Building a scientific apparatus is 1) a lot of real work, 2) heavy lifting, 3) still a little bit like playing with LEGO, and 4) a shame that we have to cover all the nice equipment back up after each shutdown. Two years ago researchers began using a tank of liquid xenon installed more than 2,000 feet deep in a salt formation in the southeastern corner of New Mexico to study neutrinos. They’re looking for clues to one of the biggest puzzles about the tiny particles: What is their mass? Finding the mass of the neutrino can help answer big questions such as how the universe grew into its present form. This tank of liquid xenon, located near Carlsbad, New Mexico in the Waste Isolation Pilot Plant (WIPP), is the Enriched Xenon Observatory – 200 (EXO-200), the most sensitive instrument of its kind in the world. In a progress report published in the journal Nature, the scientists of the EXO-200 experiment shared what two years of data tell them about the phenomenon they’re searching for: neutrinoless double-beta decay, one of the rarest processes in the universe. There’s currently no proof this type of particle decay takes place, but if it does, it can give scientists valuable information about neutrino mass. As the experiment is in the data-gathering phase, “It’s far too soon to tell the ultimate outcome of our search,” said Giorgio Gratta, Stanford physics professor and principal investigator for EXO-200. However, the experiment has achieved an almost threefold increase in sensitivity over their initial neutrinoless beta-decay search, the result of which was published in Physical Review Letters in 2012. Some of this increase can be attributed to having more data, but the team can also point to upgrades to the EXO-200 detector and software. Particle and Antiparticle: One and the Same ? The clues to neutrino mass the EXO-200 researchers are looking for are hidden in the way xenon transforms into the element barium. The isotope of xenon used by EXO-200, xenon-136, follows a rare variant of a well-known natural process called beta decay in which two neutrons decay simultaneously, emitting two electrons and two anti-neutrinos to create two protons, and one atom of xenon moves forward two spots in the Periodic Table, landing on barium. In one version of this process, called two-neutrino double-beta decay, all four particles from the two beta decays (two electrons and two anti-neutrinos) are emitted. EXO-200 was the first to see this in xenon-136; they published the result in Physical Review Letters in 2011. Zeroing in on the half-life of xenon-136 – how long it would take half the xenon-136 atoms to undergo neutrinoless double-beta decay – is also necessary because the half-life is related to the neutrino’s “effective” mass: the longer the half-life, the smaller the effective mass. The effective mass of a neutrino is a parameter that accounts for the process of neutrino mixing (“oscillations”) taking place among the three types, or flavors, of neutrinos, called electron neutrinos, muon neutrinos and tau neutrinos. The effective mass is a particular mix of the same mass parameters that govern neutrino oscillations – a mix specific to the process of neutrinoless double-beta decay. The EXO-200 results, as reported in Nature, are consistent with an effective mass for the neutrino ranging between 190 to 450 thousandths of an electronvolt – if it is its own antiparticle. For comparison consider the electron, which weighs in at half a million electronvolts. If it does exist, neutrinoless double-beta decay is one of the rarest processes in the universe. “Given two xenon-136 atoms, you could wait many, many times longer than the universe has existed before one of them decays,” said Gratta. To get around the “many times the current age of the universe” issue, EXO-200’s tank holds 200 kilograms of xenon – enough atoms, said Gratta, to considerably improve the team’s chances of seeing a decay. Its underground location in the salt formation helps protect it from background sources, such as cosmic rays or the radioactive signatures of other naturally decaying elements, which could also trigger the detectors. Gratta said the researchers originally planned to take data for three years, but have additional upgrades in the works that could increase the instrument’s sensitivity yet again. However, new upgrades will need to wait until some issues at WIPP are resolved. “Problems at the WIPP facility have sidelined our experiment since Feb. 5 and, while we intend to continue the program, it is unclear when we’ll be able to resume,” said SLAC physicist and EXO-200 member Peter Rowson. When they do, he said, the second round of upgrades is expected to significantly improve performance. “We’ve already tested and plan to install an upgrade to the electronics,” Gratta said; this should increase the detector’s ability to find the signals of the decay – if they exist. With other planned improvements, including a plan to reduce the natural background radiation even further, he said, the EXO-200 team looks forward to substantial further improvement in the search sensitivity from an additional three years of operation. Members of the NOvA experiment, along with personnel from the Scientific Computing Division and systems administrators from participating Open Science Grid institutions, recently deployed the experiment’s large-scale C++ analysis code to run on demand on participating OSG sites. The resulting production campaign was the culmination of several months of work. NOvA is attempting to observe the appearance of electron neutrinos as a result of neutrino oscillations within the NuMI beam. 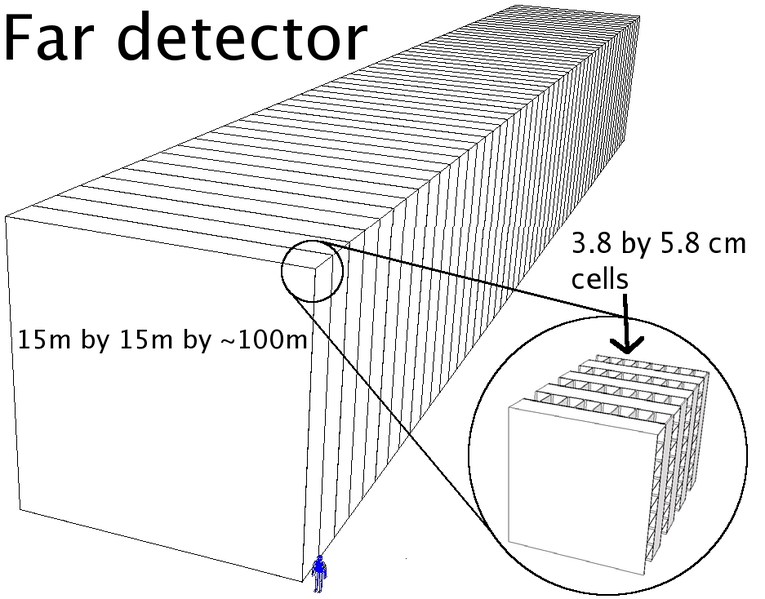 The NOvA far detector is usually run with two main independent output-event streams, a cosmic trigger and a beam trigger, which contains the oscillated neutrino signal. The data is transferred back to Fermilab as soon as it becomes available and is cataloged and archived for permanent storage. To extract the oscillated neutrino signal from this data, it is critical to understand the cosmic-ray background in great detail. This is done through computing simulations, the focus of the computational activity on OSG. The deployment team faced two major obstacles that they needed to overcome: deploying a consistent version of rapidly changing software to many different OSG sites and efficiently transferring large amounts of data to these sites. To overcome the first challenge, they used the CERN Virtual Machine File System. 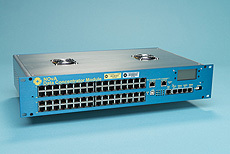 CVMFS stores an experiment’s entire software suite, including all of the external dependencies, on a set of distribution servers. As individual worker nodes require access to software libraries, they download the needed libraries and store them in a local cache. The system downloads only the software that is needed for an individual job rather than the entire suite. The second challenge, efficiently transferring data to sites, was tackled by using Fermilab’s file cataloging front end, using software called dCache, to its ENSTORE mass storage system. From dCache, the sequential access via metadata (SAM) data management system retrieves the input file and then transfers the files in series to the worker nodes, which process the input file. Once the processing is completed, output files are automatically transferred back to Fermilab for cataloging and archiving. The NOvA collaboration targeted the generation of 1,000,000 events — about three times as many events as have ever been produced in the past. This was achieved by running 10,000 jobs, requiring almost 90,000 CPU hours and producing 2 terabytes of data during two weeks of operations. NOvA’s Andrew Norman and Fermilab’s Gabriele Garzoglio spearheaded this effort, along with collaborators from Southern Methodist University, University of Nebraska-Lincoln, University of Chicago, University of California, San Diego, University of Wisconsin – Madison and FermiCloud. The lessons learned and success of these accomplishments serve as good precursors for use of the OSG by other similar experiments, such as LBNE. “A new study from an international team led by the Department of Energy’s Oak Ridge National Laboratory is guiding drug designers toward improved pharmaceuticals to treat HIV. The scientists used neutrons and x-rays to study the interactions between HIV protease, a protein produced by the HIV virus, and an antiviral drug commonly used to block virus replication. An ORNL-led team used neutrons to study the interactions between HIV protease, a protein produced by the HIV virus, and an antiviral drug called amprenavir commonly used to block virus replication. The magenta mesh is the neutron scattering density map showing the exact locations of hydrogen atoms bound to oxygen atoms. The blue dashed lines represent the strongest hydrogen bonds between the drug and the enzyme. This knowledge will help researchers improve the drug’s chemistry and increase its effectiveness.No image credit. Using neutrons from the Institut Laue-Langevin in Grenoble, France, the researchers gained a never-before-seen view of hydrogen bonds that connect the HIV protease and the drug. Unlike x-rays, neutrons can easily detect the position of hydrogen atoms. The Department of Energy’s Oak Ridge National Laboratory – home of one of only two reactor facilities in the world capable of producing californium-252 (Cf-252) – has begun implementing a new six-year contract between the DOE Isotope Program and industry to make this unique and versatile radioisotope. The new contract follows the successful completion of a four-year Cf-252 program under an agreement with a consortium of industries that use the neutron emitting radioisotope for a number of applications that focus mostly on analysis, detection and nuclear energy. “News on Fermilab’s NOvA experiment has largely focused on the assembly of the enormous blocks that make up the football-field-sized particle detector in Minnesota. But elsewhere in the NOvA collaboration, engineers have been diligently plugging away at a more hidden-away part of the detector, a component without which the giant device would never be able to intelligibly reveal what it sees. This crucial component is the circuitry and computer code that make up NOvA’s data concentrator modules, or DCMs. Now, after several years of design work and many months of testing and prototyping, engineers are completing the system. Nearly all that remains is for the modules to be installed onto the NOvA detector blocks as they, too, are installed. ‘Many people worked hard to develop a DCM system we expect to run very smoothly,’ said Fermilab’s Ron Rechenmacher, who led one of the DCM hardware-software integration efforts. The NOvA DCM is a key component of the detector’s data acquisition system, which is responsible for collecting and organizing all the particle interaction information generated inside NOvA’s two detectors. 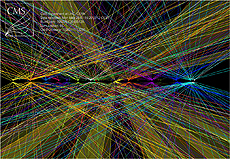 When a particle interacts inside the detector, its energy is transmitted through the detector’s fiber optic system as light signals, which get converted to digital signals by electronics boards, travel through the DCMs and eventually make their way to the larger data acquisition system. The electronics boards and DCM together convert the signals into language that experimenters can later analyze. Joe Grange, University of Florida, performed the analysis for this MiniBooNE result. “Like many of the processes we study at Fermilab, neutrino interactions probe fundamental properties of the universe. The focus of the MiniBooNE experiment has been to identify whether muon-type neutrinos spontaneously change into electron-type neutrinos in one of the neutrino beams created at the lab, possibly implying an extra neutrino state. However, recent work on the interactions of the muon-type neutrinos themselves has proven compelling as well, and this new result provides a first look at a specific muon antineutrino interaction. In 2010, MiniBooNE released the first measurement of the cross section for muon-type neutrinos to elastically interact with a neutron to produce a muon and nucleons (traditionally called a charged current quasi-elastic, or CCQE, interaction) as a function of both muon energy and production angle relative to the incoming neutrino. See the full article here. Follow the links for added information. “The conventional picture of neutrinos involves three types: the electron neutrino (and antineutrino), the muon (anti)neutrino, and the tau (anti)neutrino. As they zip through matter or space, the three types, or flavors, continually morph into each other in a phenomenon called neutrino oscillation. On the rare occasions that they interact with matter, they do so through the weak nuclear force. 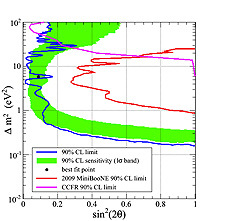 In this joint MiniBooNE-SciBooNE analysis, the experiments have excluded the area to the right of the 90 percent confidence level limit curve (blue) as a region where muon antineutrino disappearance may be occurring. This significantly narrows down the oscillation region for sterile neutrinos. But there is growing evidence for short-baseline neutrino anomalies that cannot be explained by the conventional picture. These anomalies include both an excess of events observed by Los Alamos National Laboratory’s Liquid Scintillator Neutrino Detector experiment and Fermilab’s MiniBooNE experiment and a deficit of events observed by reactor and radioactive-source experiments. If these anomalies are in fact due to neutrinos changing from one flavor to another, then there must be one or more new kinds of neutrinos. These additional neutrinos may be what are called ‘sterile neutrinos’ because they do not interact by the weak nuclear force. “For some sorts of physics, the probability of an interaction is really, really small. This is the case with neutrino physics. Every two seconds, about ten trillion protons are extracted from the Fermilab accelerator and blasted into a target, making neutrinos. These neutrinos travel through the Earth to a distant detector, in which scientists observe a few neutrino interactions. To give a sense of scale, after about 1021 protons, the MINOS experiment has observed about 3,000 neutrinos in the far detector. In rough terms, that works out to about one observed neutrino interaction every eight to 24 hours. That’s pretty straightforward to keep track of. Increasing the beam’s intensity by a factor of ten means the time between neutrino interactions shrinks to something like an hour or so – still very easy to track. The slow rate doesn’t tax the capabilities of the equipment at all. Thus, more intensity just shortens the length of time it takes to record enough data. This figure is a side view of the center of CERN’s CMS detector immediately after two beams passed through one another. Our best estimate is that 50 independent collisions occurred simultaneously. This figure gives an idea of the challenges that come with increasing the luminosity of our beams. No image credit.